The Freedom Fighters of China are invading The Bund - a tourist area along the Huangpu River in Shanghai. Led by Human Firecracker, the FFC prepares to wreak havoc using the stolen Genetically Modified Starros. Flying Dragon General prepares tea and requests that Kenan take a seat. Kenan asks his father why he became Flying Dragon General. Zhongdan explains to his son that many years ago, his brother Zhonglun was an activist. Zhongdan became infatuated with activist Kuang Meitai. Zhongdan decided to join the cause in order to woo Meitai. Meitei gets wise to Zhongdan's plan, who has since come to believe in the cause. One day a protest of theirs was met with government force. Zhongdan suffers a concussion and wakes to find Meitai watching over him. The eventually decide to leave the cause to start a family. Zhongdan and Zhonglun were out of touch for twelve years until the day the Justice League made their presence known. Meitai makes a decision to be like the American heroes and fight for freedom as Liberty Goddess, China's first superhero. Two months later, she died in a plane crash. Zhongdan discovered the crash was no accident, and was caused by The Ministry of Self-Reliance. Baixi is attempting to contact Kenan. The Justice League of China is required to assist in an emergency. Zhongdan continues to explain that after the death of his wife, he and his brother formed the Freedom Fighters of China. Zhongdan attempts to recruit his son. Baixi continues trying to communicate with Kenan before using technology to turn on the television in the living room. A news broadcast reports on the fight between the Freedom Fighters and law enforcement. Zhongdan and Kenan leave to join the fight, leaving Baixi and Deilan questioning where Flying Dragon General came from. Before Wonder-Woman and Bat-Man can leave, a paper airplane destroys the B.U.V. 's tech. At the Oriental Pearl Tower, August General in Iron informs Dr. Omen that he'll be sending in The Great Ten to take care of the situation. At The Bund, the fight rages on as Super-Man and Flying Dragon General arrive. 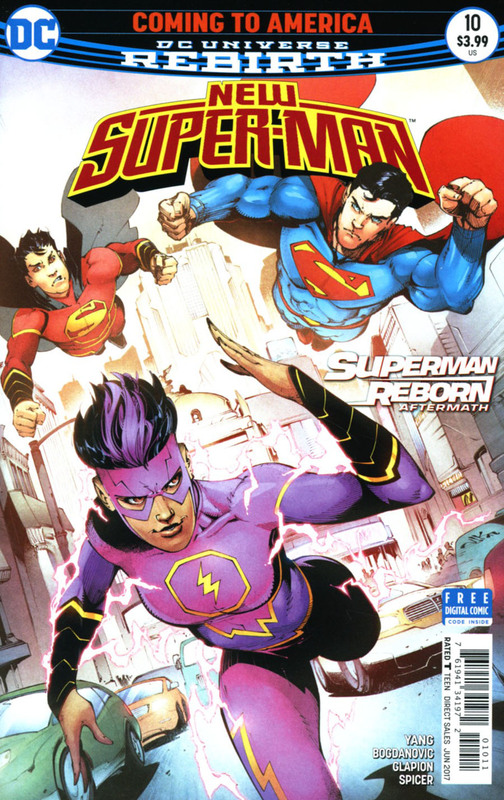 As Super-Man is introduced as a newfound ally, several probes detonate, catching the team off-guard. Bat-Man and Wonder-Woman are prepared to fight, but Human Firecracker throws two Starros their way. Firecracker now has control of their minds. Zhongdan confronts his brother. Using mind control to achieve democracy is just as bad using government force. Kenan demands Firecracker release his friends and is attacked by the FFC. Super-Man's powers disappear. His hands are bound, and he is knocked into the water, doomed to drown. Zhongdan rescues his son and pleads with Dr. Omen to help save his son. Elsewhere, a plane filled with people controlled by Starros is about to take off. Kenan recovers. It appears his powers come and go when he gets overly emotional. Dr. Omen puts a restraining device on Zhongdan. When the mission is complete, he will surrender, or she will explode his heart. Zhongdan and Kenan race off to save China. At the Center of the Chinese National Government, August General in Iron confronts Mr. Luo, the CEO of China Southeast airlines. An hour ago, China Southeast flight #28 was hijacked by the Freedom Fighters. 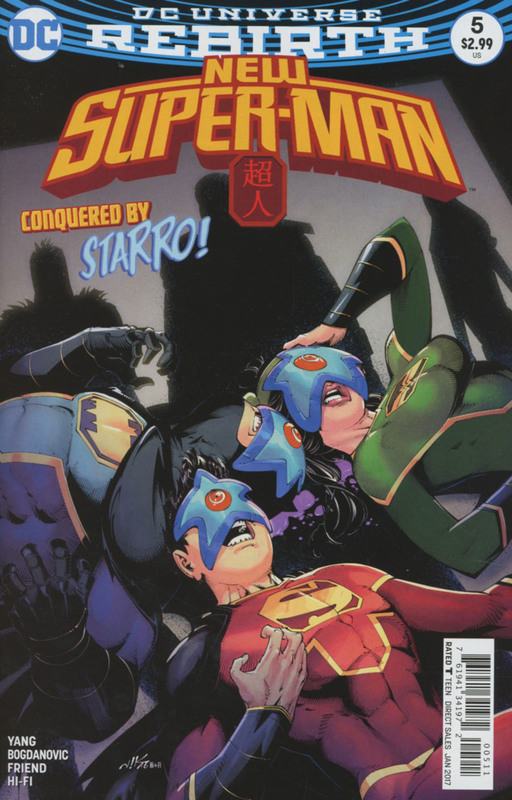 With the Justice League of China defeated, only The Great Ten can stop the Fighters from unleashing the Genetically Modified Starros on government officials and creating political change through mind control. August General in Iron proposes neutralizing the threat, but it would require The Great Ten to destroy the plane, resulting in the demise of everyone on board, including Mr. Luo's son. Mr. Luo tells The Great Ten to do what must be done, and the group flies off. Kenan and Zhongdan are in pursuit of the Fighters. Dr. Omen informs them that they have twenty minutes to stop them before The Great Ten show up and destroy the plane. 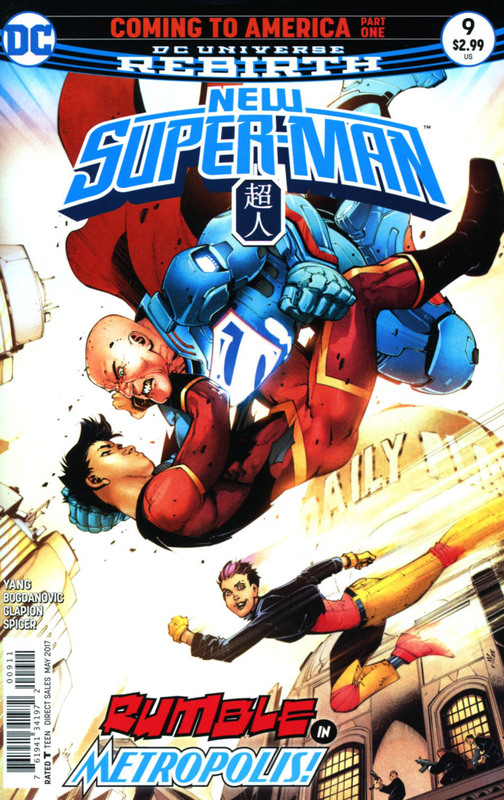 Remembering what Mingming told him last issue, Kenan focuses Superman's qi to grant him the ability of flight before jumping out of their aircraft. As Kenan makes impact with the plane, he finds that while his flight had not been restored, his invulnerability had. Zhongdan lowers the airlock as Super-Man punches a hole through the roof. A battle erupts as Kenan and his father enter the plane. Human Firecracker throws a GMO at Kenan, who catches it before it reaches his face. Folding Paper Man attacks Kenan from behind in the form of a ninja star before returning to his human form. Kenan takes the GMO and slaps it on Folding Paper Man's face before doing the same to Ghost Woman, and Blue Condor. Still in control of the GMOs, Firecracker orders those under his command to kill Kenan and Zhongdan. Kenan makes a break for it as he remembers that the original Star could be defeated by extreme cold. He finds Deilan and attempts to free her from the GMO's control, but finds that his freeze breath does not work. Wonder-Woman throws him down the aisle where Kenan is greeted by Lixin, the boy Kenan bullied in the first issue. Miraculously, Lixin is not under the control of Firecracker and tells Kenan about a freezer in the galley. After failing to free Deilan, Kenan grabs Baixi and shoves his face into a container of ice. Bat-Man is freed. With Kenan preoccupied with Deilan, Baixi is given time to hack his bat-respirator. To save everyone on board, he needs Kenan to create a hole no larger than the respirator. Kenan kicks a hole in the cabin wall, and Baixi's respirator hyper-freezes the air. The GMOs are subdued, but Human Firecracker remains to be dealt with. As Bat-Man and Wonder-Woman distract the Freedom Fighters, Kenan makes his way to the cockpit. Outside of the airliner, The Great Ten arrive. A momentary alliance is formed as the JLC and the Freedom Fighters unite to prevent The Great Ten from destroying the plane. In the cockpit, Kenan arrives to find Firecracker and Zhongdan in combat. Firecracker commands his soldiers to attack, but discovers he has no army left. He attacks Kenan with a blast from his arm cannon, which Kenan promptly destroys. Aware of Kenan's loss of power during moments of fear, Firecracker blasts Zhongdan. Kenan loses his invulnerability and is beaten down by Firecracker, who gives a speech about the embodiment of ideals. Kenan figures that Firecracker's weapons have kept the cockpit warm enough to allow his GMO to live. Super-Man tears the GMO from Firecracker's face. Zhongdan pushes his son out of the way just in time to shield him from Firecracker, who had turned his body into a literal human firecracker. Outside, Deilan sees that the plane is turning around. Kenan contacts Baixi and Deilan, asking them to return to help fly the plane. In the cockpit, Kenan pleads for his father to hold out until they reach a hospital. Zhongdan tells Kenan to fight for the people as he passes away. Kenan holds his father in his arms. Journalists bombard the JLC with questions as the plane lands. Super-Man is finally considered a hero by the people. Distraught, Kenan walks past all interviewers, including Ms. Lan. Later, Kenan, Deilan, and Baixi stand over Zhongdan's grave. Kenan believes Dr. Omen might have been behind the death of his mother. Deilan and Baixi offer to help Kenan in his investigation. At the Oriental Pearl Tower, Kenan speaks with Mingming about Superman's qi and how to better channel it. Mingming gives Kenan a business card and instructions to visit Master I-Ching, her martial arts master. In the Ministry's mountainside research laboratory, Dr. Omen enters a heavily secured room. A regeneration container rests in the middle of the room with Zhongdan's body floating inside. Dr. Omen hints through dialogue that she is Zhongdan's wife. The JLC is celebrated for their defeat of the Freedom Fighters. Bat-Man and Wonder-Woman visit the Academy of the Bat where Bat-Man is challenged to a duel by a former classmate and rival. Kenan goes to receive training from Master I-Ching to gain control of Superman's qi. Super-Man activates his super hearing and begins training with Master I-Ching. Bat-Man wins the battle for the cowl, but discovers his sister is going down a dark path. The original Super-Man Zero (see The Final Days of Superman) is confronted by Ching Lung. Superman arrives at LexCorp to stop the China White Triad's attack. 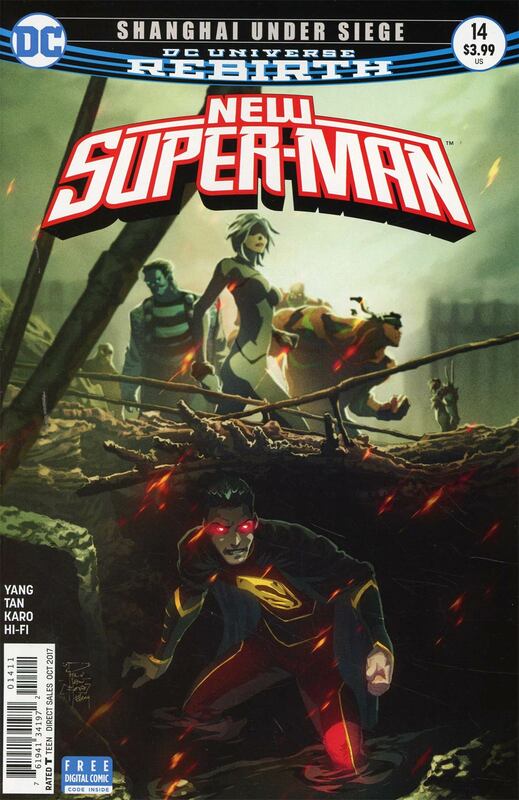 An army of demons escape after Kenan tries to use the ox-horse door rings to regain the use of Superman's powers. Deilan and Baixi discover that Kenan's father is not dead. Superman gives Kenan advice on how to hone his abilities, and two beings from the afterlife inform Kenan his parents are very much alive. Superman and Kenan have a heart-to-heart chat where the Man of Steel tells New Super-Man that a threat is coming and Kenan should prepare himself. Ching Lung reveals himself to be Master I-Ching. Professor Zhang is murdered by the China White Triad while conducting an underwater search. Kenan unlocks his super speed ability and enters a race with the JLC's Flash (Avery Ho). Bat-Man and Wonder-Woman learn of the murder of Professor Zhang and the recovery of a mysterious statue bearing the resemblance of a sorcerer named Monk Fahai - a man tied to Deilan's past. Upon inspection, the China White Triad learn that the statue houses the spirit of a turtle that turned into a human and became infected with the Doomsday virus. The statue comes to life and begins to transform into a giant Doomsday turtle as the China White Triad flees the scene. Avery and Kenan continue their race, but are halted when they see Fahai on a rampage. After several rescues, the two are reunited with Baixi and Deilan. In Metropolis, Amanda Waller pays Lex Luthor a visit while Harley Quinn extracts security footage of Kenan from his visit in the previous arc. Back in China, the JLC manages to stun the creature temporarily. Wonder-Woman is able to communicate with it and surrenders herself to bring the battle to an end. Bat-Man and Super-Man stop her and the fight continues. Elsewhere, Mr. Luo contacts Dr. Omen and orders Project Zero be released in order to end the battle with Fahai. Kenan is moments away from being killed by Fahai when a blast of heat vision frees him. Super-Man Zero has been released. The battle against Fahai rages on. During the fight, Wonder-Woman is cut in half, revealing that she is really a large green snake. Super-Man Zero unleashes his solar flare power and the fight ends. The JLC are tasked with finding the now depowered Super-Man Zero. Kenan locates him, but allows him to go free after taking pity on him and his lack of true identity. Meanwhile, back at the Ministry's headquarters, Deilan is under medical examination. Now completely in the form of a snake, Deilan's past is revealed. Long ago, a white snake fell in love with a boy and decided to try to become human. The white snake enlisted the help of a green snake to focus their qi in order to transform themselves into humans. A turtle named Fahai laughed at their attempts, but one day, the two snakes proved successful. The white snake found the boy who had since become a man, but the green snake was disheartened as she too had fallen in love with the boy. One day, a sorcerer monk attacked white snake and green snake. It was Fahai, who had also cultivated his qi. Pushing aside her jealousy, green snake defended her friend and pushed Fahai over a cliff. Unfortunately, Fahai placed a curse on green snake, imprisoning her in stone. Many years later, Dr. Omen found the statue and freed green snake, giving her the name Peng Deilan. 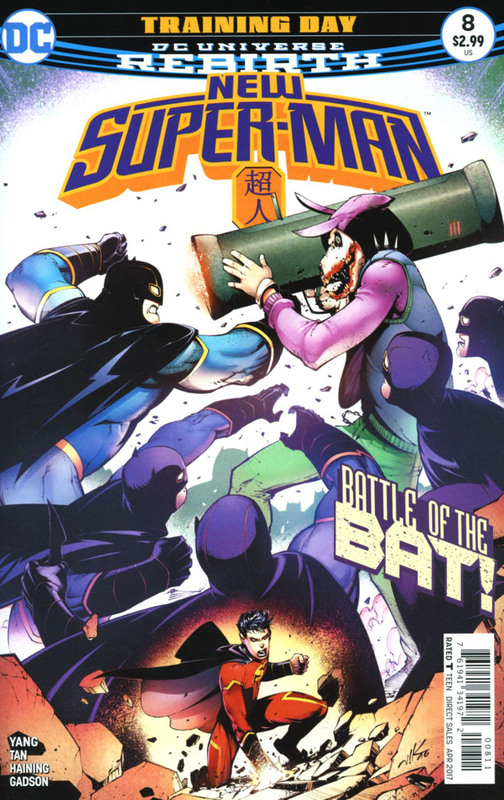 Bat-Man shows Kenan video evidence of his father's survival while elsewhere, Super-Man Zero is recharged by I-Ching and persuaded towards the side of evil. 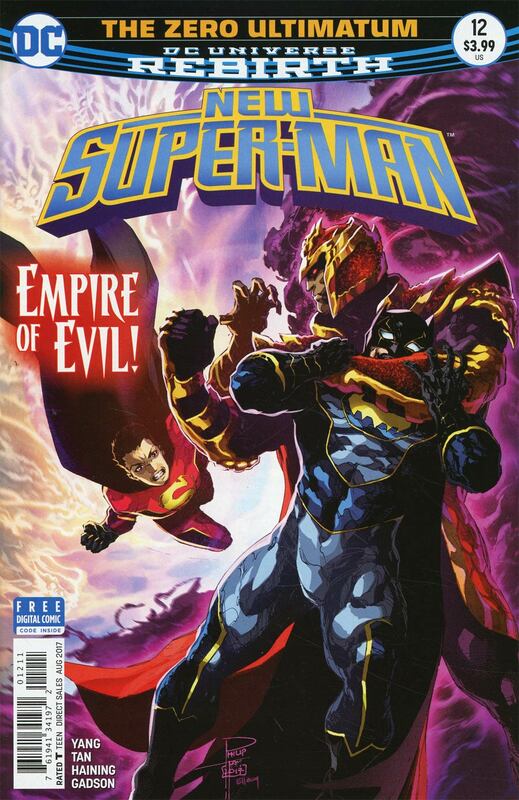 Now determined to rid the planet of superheroes, Super-Man Zero dons a new suit and takes up the name Emperor Super-Man. Kenan confronts Dr. Omen about the survival of his father, but before any real answers are given, they are attacked by Emperor Super-Man. As the issue ends, Kenan learns Dr. Omen is his mother. Shocked by Dr. Omen's revelation, Kenan finds himself questioning if he should save her and if she's even telling the truth. Before he can rescue her, Emperor Super-Man snatches Dr. Omen and freezes Kenan with his ice breath. Kenan is freed by Avery and makes a bee-line for the Loess plateau where his father was being held, only to discover that his father has been taken. I Ching and Avery are brought up to speed and Kenan decides that now is the moment to lead. In order to do that, he must find the remaining JLC members. At the Fortress of Sovereignty (formerly The Shanghai Tower), Emperor Super-Man holds Dr. Omen hostage. He demands that Dr. Omen release the prisoners of the Crab Shell Dungeon, or else he will boil her husband alive. Kenan manages to find Baixi and rescues him from suffering a spinal injury at the hands of Anathema - a Chinese version of Bane. With Bat-Man found, the JLC spring into action to locate Wonder-Woman. War has hit Shanghai. The Great Ten try to subdue Emperor Super-Man while the JLC tend to the citizens in danger on the ground. Super-Man, Flash, I-Ching, and Bat-Man find Wonder-Woman still in her snake form. Flash helps Deilan return to her human form using a grounding technique that Barry Allen showed her a while back. The technique consists of listing simple things that the person loves. Deilan is almost entirely successful, leaving her in a half-human, half-snake form. Elsewhere, the Suicide Squad receive orders from Amanda Waller to move in on the action. The JLC arrive at the Fortress of Sovereignty - formerly Shanghai Tower. Still in the tower, Mingming manages to get a message through to RobinBot and sends the team the building's schematics. As Kenan devises a plan, Master I-Ching begins feeling immense mental anguish, forcing him to sit and meditate to visit the space between spaces. There, he is attacked by a reflection of himself. Flash and Super-Man run up the building and make an entrance on the 98th floor. After subduing some guards, the two work their way down, freeing hostages as they go. While scaling the tower, Bat-Man and Wonder-Woman come under attack by the Freedom Fighters. Wonder-Woman takes a non-lethal hit to protect Bat-Man. Super-Man and Flash enter the scene. Baixi then reveals his feelings for Deilan and the two kiss, which reverts Deilan back to her human form. Meanwhile, Kenan tracks down his parents, breaking both of them free and summoning a means of escape. Before Kenan can leave, he hears screams and is encouraged to help by his father. The screams were coming from the battle between The Great Ten and Emperor Super-Man's army. 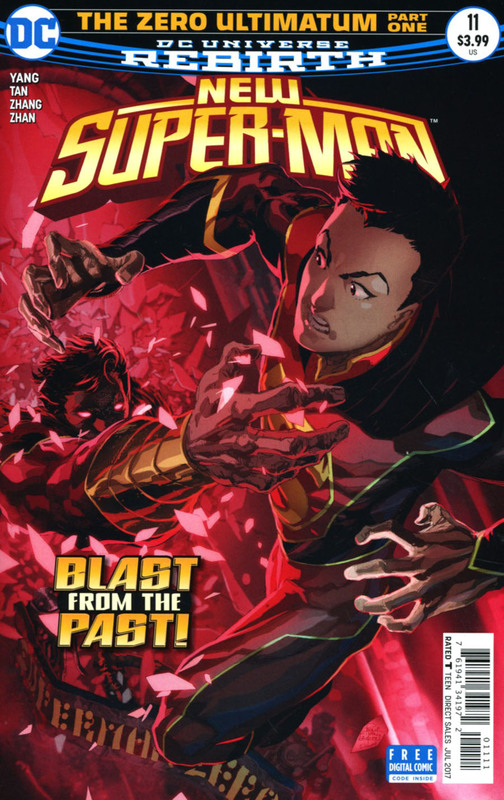 Kenan comes in and takes Emperor Super-Man by surprise, but is then hit by a massive blast of heat vision. Refusing to surrender and lose everything he's gained, Kenan fights back, unlocking his heat vision power in the process. 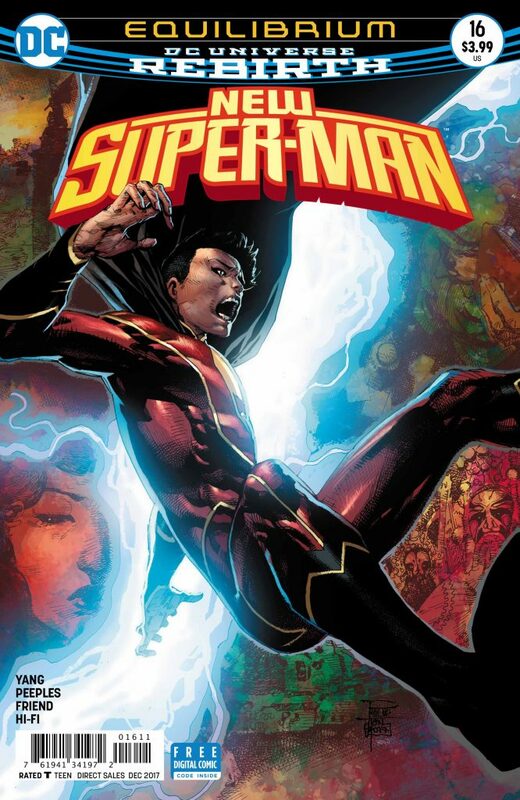 Suddenly, he becomes weakened as he sees a blade pierce Emperor Super-Man from behind. The Suicide Squad, equipped with a kryptonite sword, have arrived and they've been ordered to take out both Super-Men. 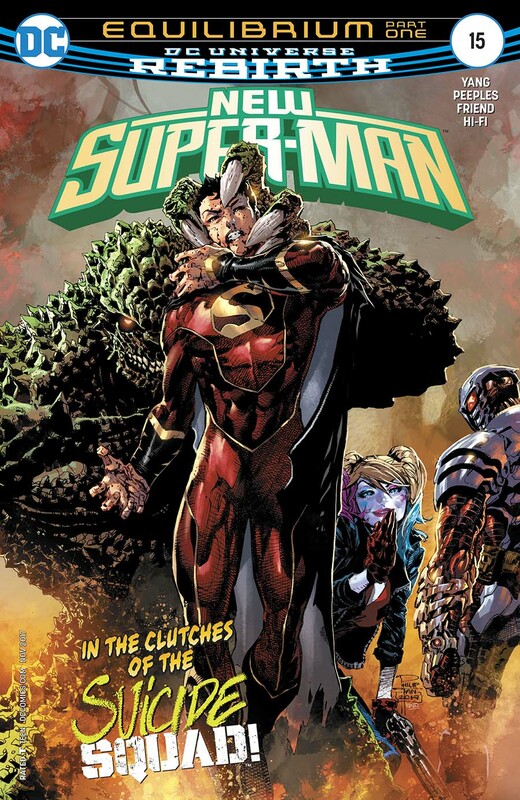 With Emperor Super-Man dead, the Suicide Squad are determined to destroy Super-Man. 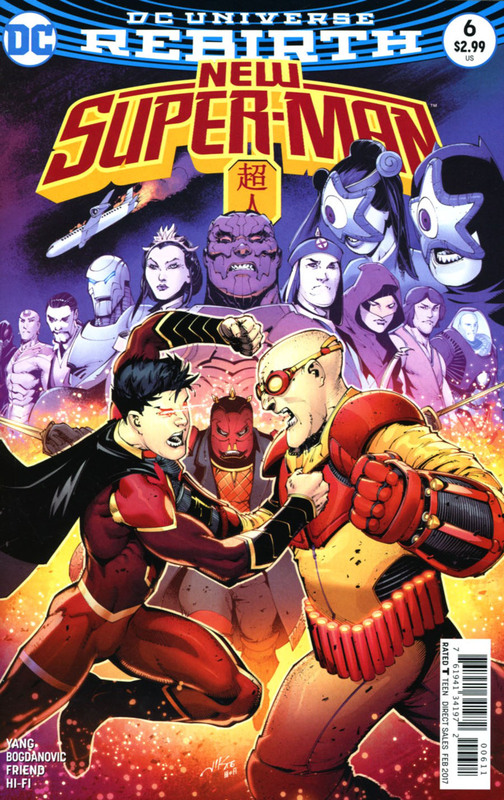 A large fight ensues involving The Great Ten, the Suicide Squad, the New Imperial Army, and the Justice League of China. During the battle, Harley Quinn manages to stab Kenan with the kryptonite sword that ended Emperor Super-Man. Kenan is evacuated to an airship by Dr. Omen where his wound is treated. Dr. Omen reveals that her identity as Meitai was a sham so she could infiltrate Zhongdan's brother's army of radicals. Omen and Zhongdan get into a fight. On another plane of existence, Master I-Ching is defeated by a dark version of himself. This dark version reveals himself to Harley Quinn and offers assistance after the JLC rendered the rest of her team useless in the fight. Emperor Super-Man is revived as a Doomsday. Kenan gets word of Emperor Super-Man's return and leaves the airship to handle the situation. As team leader, Kenan insists his teammates back off. The two Super-Men exchange blows in a scene reminiscent of the final moments in "The Death of Superman". Before Kenan dies, he awakens in another time. Ching Lung tells Kenan that he is in 1937 - the beginning. Picking up where the previous issue left off, Kenan finds himself with Ching Lung in 1937 America. A crowd of Chinese people crowd around Super-Man, asking questions about who he is. Because Kenan sees the world through the eyes of the 1930s, the citizens appear ugly and goblin-like to him. Slam Bradley arrives and starts beating up on the Chinese. Ching Lung tells Kenan to focus his qi on trigram 3 - the trigram linked to his x-ray vision and one other power. Kenan accesses this power and the racist depictions transform into normal people. Slam continues to assault innocent people until Kenan decks him. Slam charges toward Kenan, whose first instinct is to use heat vision. Without making a conscious decision, Kenan finds his qi moving from his heat vision to his freeze breath. Ching Lung expresses disappointment that Kenan didn't burn Slam to ashes. The two enter a restaurant where Lung shows Kenan a German man by the name of Von Holtzendorff. Holtzendorff makes some racist remarks and demands Lung bring him and his daughter their food. Lung then shoots fire from his eyes and murders Holtzendorff. Lung tells Kenan to retrieve an object from Holtzendorff's person called the Red Jade Dragon. This item once belonged to the Qin Dynasty, but was stolen in 1900 by Holtzendorff after he massacred the rightful owners. Lung brought Kenan to 1937 to retrieve the item because Kenan's power and the power of the Red Jade Dragon share the same root - the Bagua. Lung reveals himself to truly be All-Yang - the embodiment of the principle of yang. All-Yang explains to Kenan that he trapped I-Ching in another realm (see previous issues). All-Yang promises to release I-Ching, but only if Kenan finds the Red Jade Dragon in the present, masters the entire Bagua, and becomes Emperor. Kenan wakes up in a life support tank and frees himself. He is greeted by Mingming and the rest of the JLC. They inform Kenan that the Imperial Army was defeated, the villains were placed in the Crab Shell Prison, and the Suicide Squad returned to the U.S. Kenan fills the JLC in about his experiences and his new mission to free I-Ching. Upon telling Dr. Omen, Kenan is knocked out by a blast from a ray gun and put in a prison cell for his own protection. The JLC break Kenan out and they head fro Metropolis where they run into the American Justice League. 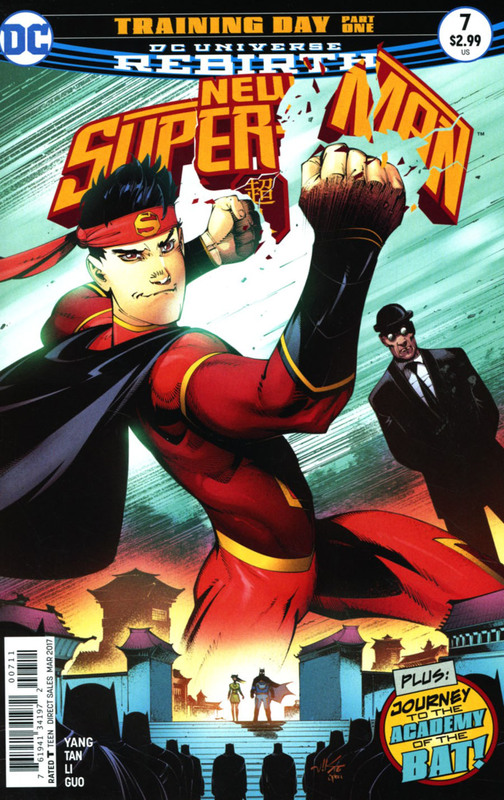 The 'New Super-Man' comic book introduces us to China's own Superman... Kenan Kong. 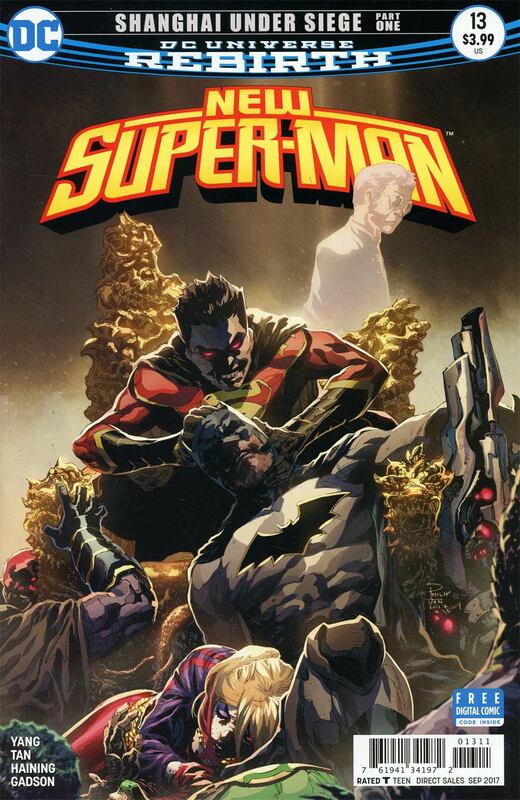 Here is a listing of the New Super-Man monthly title from the 2016 Rebirth saga that started a new era for the DC Universe of comic books, right through to its conclusion with issue #24 in 2018. The Writer, Penciller and Inker for each issue are listed within the Comic Index pages, directly below each title's name and number.